We had our 30-week ultrasound almost 2 weeks ago. Here's the photo, a little blurry for not having been properly scanned. She just keeps getting cuter. The reason we had a 30-week ultrasound is that at 20 weeks, the ultrasonologist noticed a possible problem with her bowel. Usually, this condition (known as echogenic bowel) is no big thing and goes away on its own. Sometimes, it indicates cystic fibrosis or Down syndrome. We were able to (mostly) eliminate CF by carrier screening and she has none of the other ultrasound markers of Down syndrome, so we figured the problem with her bowel would just go away on its own. 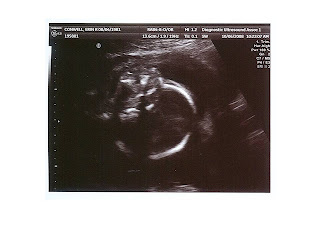 Unfortunately, at the 30-week scan, it turned out that she has an intestinal blockage. She's been diagnosed with jejunal atresia, a fairly rare condition. She'll need surgery shortly after birth to remove the blockage and repair her intestine. Most babies with this condition recover well after surgery, although there is a possibility of further complications, depending on how much of her intestine is affected. Needless to say, this is very upsetting and frightening for us. We'll be delivering at a different hospital (Brigham and Women's rather than Mount Auburn) with different doctors and she'll be transferred to Children's Hospital within a day or two for the surgery. She'll need to spend at least a week or two in the hospital, but that could be as long as a couple of months. We really won't know much more until she's born and they can assess the problem more directly. The good news is that knowing in advance means that we can get her all the help she needs right away. 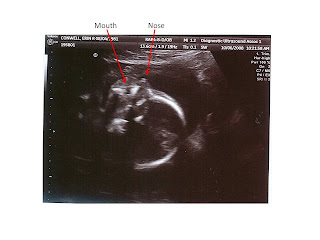 If she hadn't been too stubborn to show us her face at the 18-week ultrasound, we would never have gone in for a follow-up at 20 weeks and we wouldn't have known what was going on until she became very sick after birth. That can cause further problems which we will now be able to avoid. When she's a willful toddler or an obstinate teenager, remind us to be grateful for the stubborn streak.